Back in Sept of 2014, the Ontario Landowners Association embarked on a mission to help Patrick Brown, a Federal Conservative MP, run for the leadership of the Progressive Conservative Party of Ontario. The reasons that we chose to support him was because he was not part of the old boys club in Toronto, “or so we thought”, and also because of the many promises he made to us in a fairly intense three hour interrogation with about 25 well informed landowner members. In that meeting, Mr. Brown promised he would end the Green Energy Act, he would make party policy from the ground up with the people deciding what that policy platform would include, he would absolutely have open and free nominations in every riding including those with a sitting MPP. He also promised to clean out the back room of the party that had lost four elections to the Liberals because conservative-minded people had no one to vote for. At a meeting in Huron-Perth he appealed to the Landowners with musings of how he envisioned some government agency or ministry with MPP Jack MacLaren leading an office that would scrutinize all legislation to ensure it did not infringe on private property rights, and of course, he said that he would always be just a phone call away if we wanted to reach him with a problem. And so it was, that MPP Jack MacLaren and I flew around Ontario in a miserable dangerous snowstorm in the winter of 2015, and met with Landowner groups throughout Ontario. We also placed membership forms in the Landowner Magazine and according to the people receiving them in Toronto, “the mailboxes were overflowing with those memberships”. The final results of course was that Mr. Brown won the leadership and the OLA was ready to help create legislation to help protect individual rights and freedoms. Mr. Brown did pitch MPP Jack MacLaren, the Blue Ribbon Panel on Property Rights and that panel worked diligently to fulfill the mandate, which was to bring the importance of protecting private property to the policy convention in November of 2017. The panel encouraged people at meetings around Ontario to become delegates at the PC convention and vote to support policy that would promote a change of tone in the government bureaucracy towards property rights. Then they changed the rules in the spring of 2017. Now they would have one membership, one vote at the convention, which meant they could overload the voting delegates with the people closest to the venue which of course, was Toronto, and thus nothing would come of all our efforts to consult people across Ontario. The other breach of trust with the OLA was at the 2016 PC Annual General Meeting (AGM) in Ottawa, where Mr. Brown stepped on stage and stated that the new PC policy was to recognize ‘man-made climate change’ and put in place some form of carbon tax. This was a complete reversal on policy from the ground up and completely shook the faith of the rural people. Then came the ‘open nomination’ process. Some landowners were prepared to run as candidates for the PC’s to help restore representation for the people of Ontario. These candidates quickly found there were many roadblocks placed in their way so that they could not qualify to run against party chosen friends. As a matter of fact, the only sitting MPP the party allowed anyone to run against, was Jack MacLaren. Sam Oosterhoff of Niagara, the young unknown who surprised the back-room boys and won against party president Rick Dykstra, also had to face a nomination challenge because he had a social conservative following that did not seem to please the party’s idea of taking the middle ground away from the liberals. Many nominations for candidates across Ontario have come up with questionable results because of candidates being removed suddenly just before the nomination in favour of preferred candidates. So folks the OLA started looking for other parties that we could support in the next election. We ran into many people who said that all this would do was split the vote and we would let Kathleen Wynne, win another round. This may be so, however, it has become very clear that Mr. Brown may be as bad as the liberals. It is hard to imagine such a case, but a few days ago, I heard a radio personality say that after having Wynne, he actually wished McGuinty was back. We may find that after the Patrick Brown dictatorship has its way with us, we may be wishing we had Ms. Wynne back. 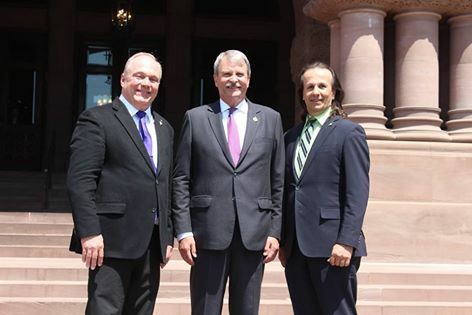 To that end, the Governors of the Ontario Landowners Association have unanimously endorsed Bob Yaciuk and the Trillium Party of Ontario and this week MPP Jack MacLaren and Bob Yaciuk appeared together at Queen’s Park, where Jack confirmed that he was leaving the PC party and joining the Trillium Party. The PC party somehow got wind of the plan, which was supposed to be announced on Tuesday, May 30, and they kicked Jack out of the party on Sunday, May 28 with an 8 a.m. email, pretending it was because of some video with Jack in it in 2012. So in conclusion, we believe that this is a great day for democracy and the people of Ontario. We hope people can get behind the Trillium party, (check out their website for yourself) and create a voting block that will help to restrain the 3 parties that are all singing from the same book. This will not be an easy undertaking, but the fact is about half of the people who don’t vote in our elections, do so because they feel that they have no one to vote for.